To combat the threat posed by viruses, Windows 8 includes a new version of Windows Defender that incorporates Microsoft Security Essentials, a security and antivirus program Microsoft formerly offered as a free download. Windows Defender scans everything that enters your computer, whether through downloads, e-mail, networks, messaging programs, flash drives, or discs. If Windows Defender notices something evil trying to enter your computer, it lets you know with a message. (That same message can appear on the Start screen or the desktop.) Then Windows Defender quarantines the virus, rendering it unable to infect your computer. 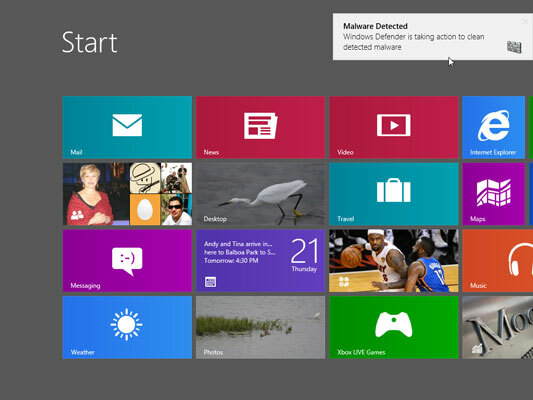 While you’re viewing the Start screen, type Windows Defender and press Enter. When you type your first letter, the Start screen switches to the Search screen and begins listing apps that match the letters you type. When you finish typing Windows Defender, that word will be alone on the list, so pressing Enter launches it. Or, to speed things up, when you spot Windows Defender’s name on the list, stop typing. Then click the adjacent Windows Defender icon to launch the program. Windows Defender immediately performs a quick scan of your PC. Windows Defender normally doesn’t scan flash drives and portable hard drives. To include them, click the program’s Settings tab, click Advanced, and put a check mark in the box called Scan Removable Drives. Click Save Changes to save the changes. The program’s scans will take slightly longer, but the results are worth it. Updates for Windows Defender arrive automatically through Windows Update. That’s why it’s important to connect with the Internet often, so Windows Update can keep Windows Defender working at the top of its game. Only open attachments that you’re expecting. If you receive something unexpected from a friend, don’t open it. Instead, e-mail or phone that person to see whether he or she really sent you something. Don’t install two virus checkers because they often quarrel. If you want to test a different program, first uninstall your existing one from the Control Panel’s Programs area. (You may need to restart your PC afterward.) It’s then safe to install another virus checker that you want to try.